Albuminuria and hypertension are predictors of poor renal and cardiovascular outcome in patients with diabetes (1,2 ⇓). Antihypertensive treatment, especially ACE-I, has been shown to reduce albuminuria, to diminish loss of kidney function, and to improve survival in type I patients with DN (1–3 ⇓ ⇓). Studies of diabetic and nondiabetic kidney disease suggest the initial degree of reduction in albuminuria after blockade of the renin-angiotensin system (RAS) predicts an attenuated rate of decline in GFR, as reviewed by Rossing (1). As a consequence, albuminuria may serve as a surrogate end point for monitoring treatment efficacy and prognosis in DN (4). A superior effect on BP and a tendency toward a more pronounced drop in urinary albumin excretion of dual blockade of the RAS compared with single blockade has been reported in type II patients with microalbuminuria (5). We have recently shown additional drop in albuminuria and diastolic BP when adding an angiotensin receptor blocker (ARB) to angiotensin-converting enzyme inhibitor (ACE-I) treatment in type l patients with albuminuria >1 g/24 h and BP >135/85 mmHg, despite conventional antihypertensive therapy including three different agents (6). However, this subgroup is highly selected; therefore, it may differ from the patients in general with DN, especially with regard to RAS activity and sensitivity to blockade of the RAS system. Furthermore, our earlier design as well as others in DN did not include a placebo period; as a consequence, we could not directly compare the effect of dual blockade of the RAS with effectiveness of both monotherapies, which could help elucidate the underlying mechanisms of progression of DN in addition to future treatment strategy. Therefore, in a placebo-controlled, double-blind, randomized, crossover trial, we tested if dual blockade of the RAS with both an ACE-I and an ARB is superior to either drug alone in a representative group of type I diabetic patients with DN. From Steno Diabetes Center we included 20 White type I patients with DN. Diabetic nephropathy was diagnosed clinically if the following criteria were fulfilled: persistent albuminuria >300 mg/24 h in two of three consecutive determinations, presence of diabetic retinopathy, and no other kidney or renal tract disease (7,8 ⇓). All patients had been dependent on insulin treatment from the time of diagnosis and received at least two daily injections of insulin. Patients were on a diabetic diet (45 to 55% carbohydrates, 30 to 35% fat, and 15 to 20% protein) without restriction in sodium or protein intake. Exclusion criteria at start of the study were: plasma potassium > 4.8 mmol/L, pregnancy, no use of contraceptives, age < 18 yr, alcohol or medicine abuse, inability to understand the patient information, contraindication to treatment with ACE-I or ARBs systolic BP < 100 mmHg, GFR < 30 ml/min, heart failure, myocardial infarction, or coronary bypass within the last 6 mo. On the basis of medical records, we invited all (n = 60) potential candidates to participate in the study; 22 accepted and were invited to a screening visit. Twenty fulfilled all inclusion criteria and were included; of these, 18 completed the study (see below). We performed a randomized, double-blind, placebo-controlled crossover trial. The study consisted of an initial 4-wk single-blind placebo period (run-in) followed by four treatment periods, each lasting 8 wk. Each patient received treatment with placebo, 20 mg of benazepril once daily, 80 mg of valsartan once daily, and the combination of 20 mg of benazepril and 80 mg of valsartan once daily in random order. The computerized randomization was done by the manufacturing company (Novartis Healthcare A/S, Basel, Switzerland). The code was kept in a concealed envelope and not broken until all data were entered in a database after the last patient visit. Patients attended the clinic nine times: one screening visit and subsequently 2 and 8 wk after start of each treatment period. At the screening visit, information on inclusion and exclusion criteria in addition to informed consent were obtained. Then all antihypertensive medication was withdrawn, except for loop diuretics, which were continued unchanged throughout the study to prevent edema. Patients received placebo medication for both benazepril and valsartan during the run-in period. Throughout the whole study, BP was monitored at home by the patients to ensure that the BP did not exceed the safety limits (>160/105 mmHg). BP, plasma potassium, and plasma creatinine were measured 2 wk after the beginning of each treatment period for safety reasons. At the end of each treatment period, we assessed clinical end points, including the primary end point (albuminuria) and the secondary end points (24-h arterial BP and GFR). Drug compliance was assessed by tablet counts. The study protocol was in accordance with the Declaration of Helsinki and was approved by the local ethical committee. Albuminuria was determined by three consecutive 24-h urine collections, completed immediately before each visit at the end of each treatment period (Turbidimetry, Cobas Mira Plus; Roche, Montclair, NJ). To correct the reduction in 24-h albuminuria for changes in GFR and plasma albumin, we constructed the following “fractional clearance” index: [24-h albuminuria]/([plasma albumin concentration] × [GFR]). In addition, sodium, urea, creatinine, and carbamide excretion in the urine were determined (Cobas Mira Plus). Arterial BP after each treatment period was assessed by 24-h ambulatory BP measurements with the Takeda TM2420 device; model 6 and 7 (A&D, Medical Inc., Tokyo, Japan). A measurement of the BP was performed every 15 min during daytime (from 7:00 a.m. to 11:00 p.m.) and every 30 min during nighttime (from 11:00 p.m. to 7:00 a.m.) Values were averaged for each hour before calculating the mean 24-h, day and night arterial BP. GFR was measured after a single intravenous injection of 3.7 MBq 51Cr-EDTA at 8:30 a.m. by following the plasma clearance of the tracer for 4 h (9,10 ⇓). Extra renal loss was corrected for by subtracting 3.7 ml/min (11). The small underestimation (10%) of 51Cr-EDTA renal clearance versus renal clearance of inulin was corrected for by multiplying the EDTA clearance by 1.10 (11). The results were standardized for 1.73 m2 body surface area. The mean day-to-day coefficient of variation in GFR is 4% in our laboratory. Before carrying out the study, we calculated the SD (log scale: 0.1771) of the mean difference in urinary albumin excretion rate in three consecutive 24-h urine samples collected twice within 3 mo in 36 type I patients with DN. On the basis of these data, a sample-size calculation revealed a necessary minimum of 16 patients to detect a 25% difference in change in urinary albumin excretion rate (α = 0.05; β = 0.80). Normally distributed variables are expressed as mean (SEM). Values for albuminuria, AngII, and renin were logarithmically transformed and expressed as geometric mean (95% CI) because of their positively skewed distribution. Changes in these variables between different treatments are expressed in percent. Data were analyzed using linear mixed models (14). The software used was R (http://www.r-project.org) and SPSS 10.0 (SPSS Inc., Chicago, IL). The adapted model was one with fixed effects of treatments, visit and treatment sequence, and a random effect of person included to account for the person-dependencies in data. For the simplest models, the P value and effects correspond to results obtained from paired t test and two-way ANOVA, but these models allows for more elaborate exploration of the material. Tests for presence of effects were performed as likelihood ratio tests, and final estimates were reported as REML estimates (14). We were not able to include type of previous treatment period in the statistical model due to lack of power; we therefore performed additional test for time and carryover effects as described by Altman (15) and compared treatment response in patients starting with placebo with patients treated with active compounds in the first period. Linear regression analyses were made between the changes in arterial BP and the changes in albuminuria: ln [albuminuria during dual blockade/albuminuria during placebo or monotherapy]. P < 0.05 was considered significant (two-tailed). Twenty patients were randomized in the trial; eighteen completed the study and were included in the statistical analysis (see below). Patient characteristics at baseline are shown in Table 1. Two patients had the dose of furosemide doubled during the study, one due to fluid retention during the placebo period (furosemide from 80 mg to 160 mg) and one due to increasing plasma potassium during dual blockade (furosemide from 20 mg to 40 mg). The median (IQR) duration of all treatment periods were 58 d (54 to 58), and compliance as assessed by tablet count was [median (IQR)] 100% (98 to 100%) (no difference between the four types of treatments). Albuminuria and 24-h BP were significantly reduced by all three types of interruption of the RAS compared with placebo (Table 2). Benazepril and valsartan were equally effective. Dual blockade of the RAS induced an additional reduction in albuminuria [mean (95% CI)] of 43% (29 to 54%) compared with any type of monotherapy (P < 0.01). Mean albuminuria during dual blockade therapy was 138 mg/24 h (95% CI, 91 to 208) compared with 239 (169 to 346) mg/24 h during benazepril treatment and 225 (146 to 345) mg/24 h during valsartan (Figure 1). Fractional clearance index of albuminuria showed that dual blockade induced an additional reduction in albuminuria of [mean (95% CI)] 37% (22 to 49%) compared with benazepril and 39% (23 to 51%) compared with valsartan (Table 2). Individual responses with regard to albuminuria are shown in Figure 2. 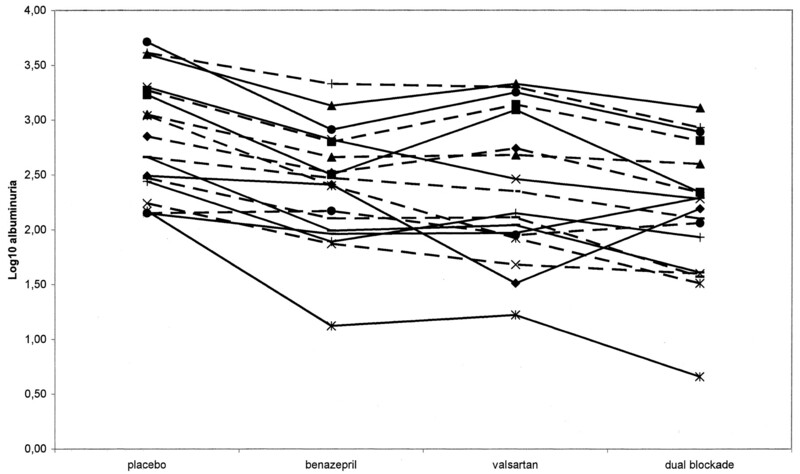 Linear regression showed a close correlation between individual changes in albuminuria on benazepril and dual blockade (R = 0.78; P < 0.001; Figure 3) as well as with valsartan versus dual blockade (R = 0.63; P = 0.005; data not shown). Figure 1. Albuminuria and BP after blockade of the renin-angiotensin system (RAS) in 18 type 1 diabetic patients with diabetic nephropathy. Albuminuria levels are geometric mean with 95% CI; BP levels are mean with SEM. Figure 2. Individual changes in albuminuria as response to blockade of the RAS in type 1 diabetic patients with diabetic nephropathy. Figure 3. Correlations between treatment response on benazepril and dual blockade of the RAS in type 1 diabetic patients with diabetic nephropathy. An additional reduction in 24-h systolic BP on dual blockade of 6 (0 to 13) and 7 (1 to 14) mmHg (versus benazepril [P = 0.06] and valsartan [P = 0.04], respectively) and a reduction of 7 (4 to 10) mmHg diastolic compared with both monotherapies (P < 0.001) was demonstrated. Absolute 24-h BP on dual blockade therapy was 122 (4)/66 (2) mmHg, 129 (3)/73 (2) on benazepril and 129 (2)/73 (2) mmHg on valsartan (Figure 1). No significant changes were found in the 24-h mean heart rate. The reduction in BP was sustained both during daytime and nighttime (Table 2). 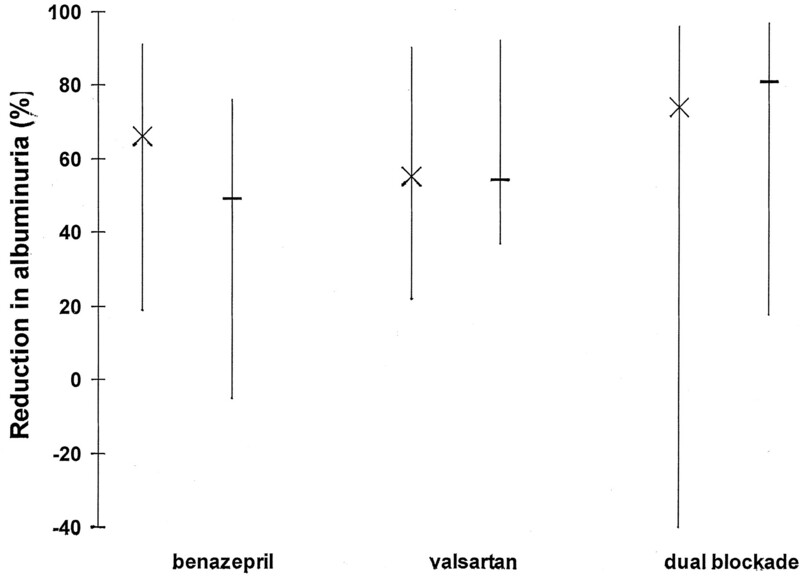 Linear regression also revealed a close correlation between individual decline in mean BP on benazepril and dual blockade (R = 0.86; P < 0.001; Figure 3), whereas this was not seen with valsartan versus dual blockade (R = 0.39; P = 0.11; data not shown). Mean office BP 2 wk after start of each treatment were (mmHg): placebo 144 (3)/79 (2), benazepril 137 (2)/79 (2), valsartan 138 (4)/79 (3), and dual blockade 134 (5)/77 (2), of which only the reductions seen in systolic BP with benazepril and dual blockade were statistically significant (P = 0.02). Linear regression analysis showed a correlation between the change in mean arterial BP and the change in albuminuria when comparing dual blockade with placebo (R = 0.51; P = 0.03) and valsartan treatment (R = 0.65; P < 0.01), but not dual blockade versus benazepril treatment (R = 0.11, P = 0.66). GFR was reversibly lowered on dual blockade of the RAS compared with both placebo (Table 2) and monotherapies. Treatment with both benazepril and valsartan resulted in a reversible reduction in GFR of 7 (3 to 11) ml/min per 1.73 m2 compared with benazepril (P < 0.01) and 6 (2 to 11) ml/min per 1.73 m2 compared with valsartan (P < 0.01). There was a nonsignificant drop in GFR of 3 (−1 to 7) and 4 (−1 to 8) ml/min per 1.73 m2 on benazepril (P = 0.18) and valsartan (P = 0.10), respectively. Dual blockade of the RAS induced a significant decline in plasma cholesterol and plasma LDL cholesterol compared with placebo and benazepril (Table 3). No changes were seen in plasma HDL cholesterol and triglyceride. The statistical analyses revealed no evidence of time or carryover effects for any of the treatments. Figure 4 shows comparable decline in albuminuria in patients treated with placebo in the first period compared with patients treated with active compounds in the first period. Similar pattern were seen with respect to BP (data not shown). Figure 4. Evaluation of carryover effects of treatments on change in albuminuria. Patients receiving placebo treatment in the initial period (—) compared with patients treated with active compounds in the first period (X). Levels are medians, and bars represent range. NS within all treatments. Six patients experienced signs of transient hypotension after start of dual blockade treatment, and two patients had similar symptoms after initiating benazepril. One of these patients experienced hypotension and general discomfort 2 d after initiating treatment with benazepril and therefore withdrew from the study. One patient stopped taking the study medication during benazepril treatment due to hospitalization not related to the study medication (apoplexia cerebri and sepsis). Dual blockade caused an increase in plasma potassium of approx. 0.3 mmol/L compared with monotherapies (Table 2). All but one plasma-potassium value were <5.0 mmol/L. Hemoglobin decreased (Table 2); however, none of the patients needed treatment for anemia during the study. No other adverse effects were reported. The novel findings in our study are the demonstration of an additive effect on albuminuria and 24-h BP of treatment with recommended doses of both ACE-I and ARB in a group of type I diabetic patients with DN and a wide range of albuminuria up to nephrotic range. Our study indicates the beneficial effect of interrupting the RAS is mediated mainly through blocking the action of AngII. In addition, a beneficial effect of dual blockade on lipid profiles is demonstrated. Dual blockade was safe and well tolerated. The clinical significant decrease in GFR observed in the present study was reversible, because the mean GFR of all the patients in each treatment period was unchanged and an equal number of patients received dual blockade throughout the study (no time/order effect). The finding is in accordance with previous results (16) and is likely to be caused by the changes in systemic BP. The rationale for dual blockade of the RAS system is based on the different mechanisms of action of the two drug classes. In addition to decreased AngII formation ACE-I decrease the degradation of bradykinin, a powerful vasodilator (17). However, an insufficient response to ACE-I might be explained by incomplete blockade of the ACE enzyme or by the generation of AngII by ACE-independent pathways such as Chymase (18). The incomplete blockade possibly explains the observation that plasma AngII levels return to normal after chronic ACE-I treatment, a phenomenon called ACE-escape (19). Treatment with AngII receptor blockers may result in more complete blockade of the unfavorable actions of AngII mediated through the AngII type 1 receptor. However, new data from animal studies indicate that some of the deleterious effects of AngII on glomerular cell migration, tubular cell proliferation, and development of urinary protein excretion may be mediated through the AngII type 2 receptor (20–22 ⇓ ⇓). Therefore, treatment with both ACE-I and ARB may offer synergistic blockade of the RAS, not obtainable with either drug alone. The effects of ACE-I and ARB on main end points were almost identical; our study indicates the beneficial effect of interrupting the RAS is mediated solely through blocking the action of AngII and not through the bradykinin or chymase pathways. Instead, our study supports the concept that dual blockade offers more complete blockade of the intrarenal and systemic AngII formation than monotherapy. In accordance, Komine et al. (23) demonstrated in an animal model that dual RAS blockade with captopril (1.7 mg/d) + losartan (0.7 mg/d) treatment further reduces renal tissue AngII level compared with treatment with captopril (2.4 mg/d) or losartan (1.7 mg/d) alone. Furthermore, tripling the dose of captopril (7.5 mg/d) or losartan (6.0 mg/d) did not reduce the intrarenal AngII to the level observed with low-dose dual blockade therapy (23). The lower renal tissue AngII during ARB treatment may be caused by decreased binding to the receptor and internalization of AngII in the presence of ARB and/or increased degradation of AngII. On the other hand, conflicting results from studies of dual blockade of the RAS on BP and urinary protein excretion in subtotally nephrectomized rats have been reported (24,25 ⇓). The CALM-study of type II diabetic patients with microalbuminuria and hypertension found an enhanced reduction in BP by dual blockade (16 mg candesartan cilexetil and 20 mg lisinopril) compared with therapy with either agent alone (5). The additional effect of combination therapy was a reduction in systolic BP of 10 mmHg and a tendency toward a more pronounced drop in urinary albumin excretion. Once DN has developed, we have recently demonstrated a beneficial short-term effect of dual blockade of the RAS in the subset of type I and type II diabetic patients with diabetic nephropathy responding insufficiently to recommended antihypertensive therapy (6,26 ⇓). As described earlier, these studies were carried out in a different patient category using a different design. In addition, the present study demonstrated an additive effect on albuminuria and BP of combining ACE-I with ARB irrespective of which monotherapy is the initial treatment. In nondiabetic renal disease, a superior effect of dual blockade compared with single blockade were reported in several short-term open-label studies (27–30 ⇓ ⇓ ⇓). The COOPERATE trial (31) is the first long-term trial addressing the effect of dual blockade on primary renal end points. This double-blind randomized study of 263 patients with nondiabetic renal disease demonstrated that 11% of patients on 100 mg of losartan + 3 mg of trandolapril developed doubling of s-creatinine or reached end-stage renal disease during a median of 3 yr of follow-up, whereas 23% reached the primary end points during treatment with either monotherapy (P = 0.02) (31). The additive effect of benazepril and valsartan on albuminuria, BP, and plasma renin concentration indicate incomplete blockade of the RAS on 20 mg of benazepril or 80 mg of valsartan alone. Therefore, the potential role of dual blockade depends on whether the observed effects in our study could be obtained by increasing the dose of monotherapy. Unfortunately, there are no dose-escalation studies of the antiproteinuric and antihypertensive effect of >100 mg of captopril daily or >20 mg of enalapril/lisinopril/benazepril daily in humans with DN. Patients in the present study received 80 mg of valsartan. No further reduction of urinary albumin excretion rate and BP have been reported when comparing 80 and 160 mg in a 1-yr study of 62 type II patients with microalbuminuria (32). From studies in patients with moderate-to-severe essential hypertension, no evidence of an additional antihypertensive effect of doses of captopril up to 600 mg or enalapril/benazepril up to 80 mg (33–36 ⇓ ⇓ ⇓) exists. Increasing the dose of valsartan from 80 to 160 mg resulted in an additional drop in systolic and diastolic BP of < 1 mmHg in mild-to-moderate hypertension (37). Consequently, our findings of an additive effect on albuminuria and BP suggest a more complete blockade of the RAS when using both ACE-I and ARB. Agarwal (38) reported that adding 50 mg of losartan daily to 40 mg of lisinopril daily had no effect on BP and proteinuria in a small heterogeneous group of predominantly severely obese, hypertensive, proteinuric diabetic African Americans with advanced renal failure. Surprisingly this study showed a lowered plasma renin activity and enhanced GFR during losartan on top of ACE-I treatment. Limitations of this study include underdosing with losartan, because 100 mg is more effective than 50 mg on both albuminuria and BP in patients with DN (39). Furthermore, the findings of Agarwal cannot be extrapolated to other ethnic groups due to differences in RAS activity and response to RAS blockade (40,41 ⇓). Therefore, more studies of dual blockade of the RAS including patients treated with maximal recommended doses of ACE-I are needed. The design of the present study does not allow us to distinguish between a specific antiproteinuric effect of dual blockade of the RAS and the effect of lowering BP per se. To do so, a head-to-head comparison between dual blockade and mono blockade of the RAS in combination with other antihypertensive drugs aiming at identical BP levels is needed. However, the observed relation between changes in BP and changes in albuminuria suggests an important hemodynamic component. This fact does not diminish the importance of our observations, because both reduction in BP and albuminuria is essential treatment goals in diabetic patients with kidney disease. On the other hand, a reduction in albuminuria independent of BP reduction when starting losartan treatment has been suggested in 62 patients with diabetic and nondiabetic renal disease (42). The lengths of our treatment periods were 8 wk. We cannot be sure if full treatment effects have developed; however, studies in diabetic (43,44 ⇓) and nondiabetic kidney disease (45) have suggested a maximal antiproteinuric and antihypertensive effect of ARB is present after less than 1 mo of treatment. Crossover trials are vulnerable to time and carryover effects. We found no evidence of any time, carryover, or treatment sequence effect. This is in accordance with our previous study applying identical types and length of treatment periods (although different populations and design) when evaluating the effect of dual blockade therapy (6,26 ⇓). Our study suggested a beneficial effect dual blockade of the RAS on plasma cholesterol and plasma LDL-cholesterol levels. Studies have found a cholesterol-lowering effect of treatment with ACE-I or ARB in type I diabetic patients with DN (46,47 ⇓). The reduction in albuminuria is probably the main reason underlying our findings, as documented for patients obtaining reversal of nephrotic syndrome (48). If confirmed, a beneficial impact of dual blockade on lipid profile may further contribute to long-term renal and cardiovascular protection. In conclusion, our short-term study suggests that treatment with both ACE-I and ARB in recommended doses offer additive renal and cardiovascular protection in type I patients with DN. This study was supported by P. Carl Petersens Foundation, Copenhagen, The Danish Diabetes Association, and a grant from Novartis Healthcare A/S, Basel, Switzerland. The authors wish to express appreciation to Tina R. Juhl, Birgitte V. Hansen, Ulla M. Smidt, and Inge-Lise Rossing for technical assistance. Microalbuminuria in Type 2 Diabetes and Hypertension: A marker, treatment target, or innocent bystander?